O/o Special Judge, CBI, Assam Additional Court No. 1, Guwahati. Applications are invited from the eligible employees of the establishments of District & Sessions Judge's in Assam for filling up the following vacant post in the Office of the Special Judge, CBI, Assam, Additional Court No. 1, Chandmari, Guwahati-3. Pay: PB-4-Rs. 30,000/- to 1,10,000-- + G.P. Rs.14,500/-. Eligibility Criteria: The applicant should possess the requisite qualifications, as mentioned under Rule 6 of the Assam District and Session Judges Establishment (Ministerial) Service Rules. 1987. i.e. he/she must have served continuously as the Sheristadar of Additional District & Sessions Judge or as the Head Assistant in the District & Sessions Judge's Establishment for at least 5 years. How to apply: Applications must be submitted through proper channel along with the copy of the respective Service Book. • The application will have to be submitted in Standard, Form. • 3 (three) copies of recent passport size colour photographs should be enclosed with the application. 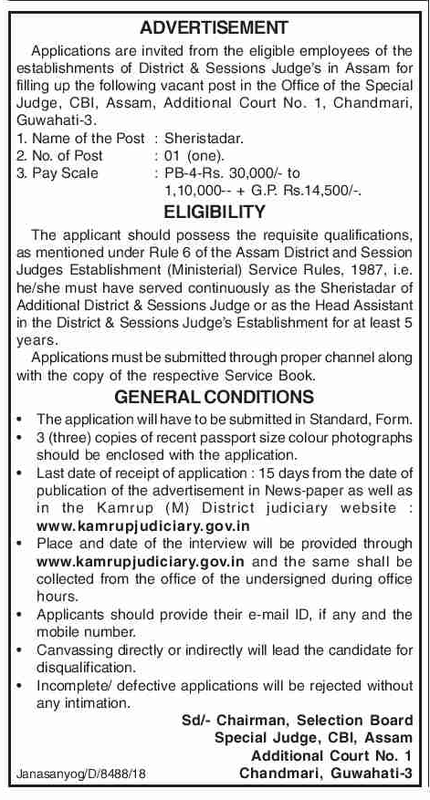 • Place and date of the interview will be provided through www.kamrupjudiciary.gov.in and the same shall be collected from the office of the undersigned during office hours. • Applicants should provide their e-mail ID, if any and the mobile number. • Canvassing directly or indirectly will lead the candidate for disqualification. • Incomplete/ defective applications will be rejected without any intimation.